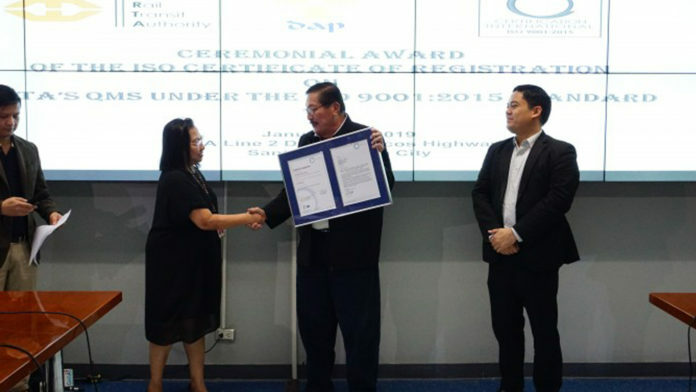 The Light Rail Transit Authority (LRTA) on Thursday formally received its ISO 9001:2015 registration certificate recognizing its efforts to improve the operations of the Light Rail Transit (LRT) system. LRTA Administrator Reynaldo Berroya said the recognition serves as a reaffirmation of its commitment to provide quality rail transport in the country. “With the certification, LRTA has proven its strong commitment to good governance and excellent service while reaffirming its mission of providing world-class light rail transport systems in the country,” Berroya said in a statement. The Certificate of Registration for Operations and Maintenance Management from Certification International of the Philippines, Inc. (CIPI) was secured by the LRTA last December 21. The conferment of the ISO certification will be valid until 2021. “This certification attests to the competence and dedication of LRTA personnel to their work,” Berroya said. “This will boost the morale of LRTA staff and will motivate them to be more work-driven in order to achieve LRTA’s quality policy steered on being at par with international standards and on fostering excellence in service to the Filipino people,” he added. The ISO Quality Management System certification process started on the 3rd quarter of 2017 with the Development Academy of the Philippines as consultant. The certification was given after the LRTA has submitted documentary requirements and passed the auditing stages conducted on June 4 and 11 last year.